Loyalist Arms has a large inventory of footwear that we would like to move before the Reenactment season starts. The above two shoe styles come with buckles which you will have to place and fit according to your foot. 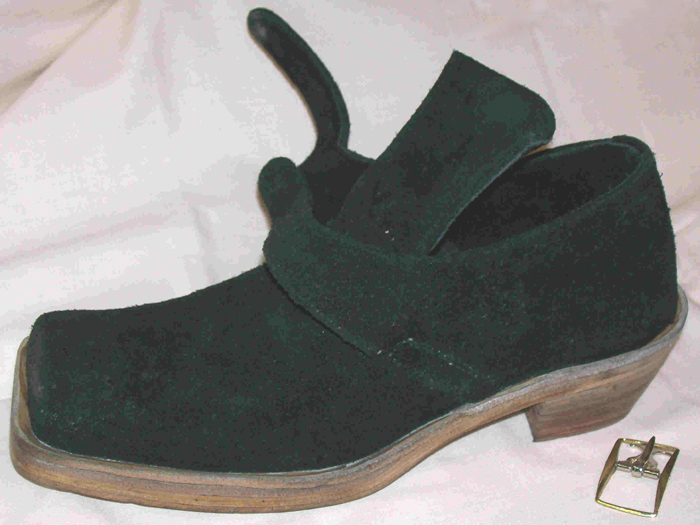 Late 16th – 17thC open side men’s shoes, (pikeman’s shoes). Available in brown rough out only. Also: Current stock of Musketeer/Buccaneer boots in black & brown in several sizes. ALL IN-STORE BOOTS are DISCOUNTED by $40.00 PER PAIR. This sale only applies to our current inventory. When certain sizes or colours are sold out, then they are gone. We cannot offer rain checks nor special order in foot wear at discounted prices. All discounts are applied to the item’s regular price. To see our regular prices for these items, please click the links above. This footwear is “off the shelf” regular sizes and are not custom fitted. Tell us which size shoe/boot you normally wear, and we’ll help you find a pair that’s right for you, although we cannot guarantee perfect fit. It may be best to order one size up to have plenty of room for a liner or heavy stockings. All shoes are final sale. We can make an exchange if available, but no refunds. In the event of a return, buyer pays all shipping back & forth. It’s better to be sure of which size before you order, to save you extra costs and hassles. This entry was posted in Uncategorized on March 25, 2015 by loyalist.